Our projects have taken place throughout the United States and around the world. We’ve moved everything from huge, deep-water tugboats and nuclear submarines, to the Washington State and Canadian ferries under construction, from gigantic fish weirs to complete bridge structures such as the Willis Avenue bridge in New York City. Have a look at what we can do. U505 is often described as the most popular exhibit at the Chicago Museum of Science and Industry on Lake Shore Drive in Chicago. In 2005, the contract was made to install the submarine in an underground exhibit hall. This dropped the number of permits required from over 200 to about 68, cutting about 3 years off the project. Because of our naval architectural background and ability to provide a turn key move and lowering, we were selected as the preferred moving contractor. The entire move was complex and took about 3 weeks to execute. We used ironworkers from IW local 1 in Chicago to help with the move. A Bridge Delivered from stephen mallon on Vimeo. Nordholm Rentals equipment and expertise was critical to the successful transport and installation of the Willis Avenue Bridge in NYC. The Willis Ave Bridge was built in Coeymans, New York, just outside Albany, and floated down the Hudson River. It’s a swing span bridge and its final location is in the center of Harlem. The General Contractor was Kiewit. We were involved in the Naval architecture, load out, sea fastenings and the final jack down into position. We also advised on the marine operational aspects of the bridge installation, with crane weights of about 3000 tons. One of the Nordholm Companies latest projects is a heavy lift and transport job at Total Terminals International in the Port of Long Beach, CA. Nordholm designed an entirely new semi-automated lifting system for a 35-foot raise of 6 ZPMC container cranes. The Port of Long Beach is one of the world’s busiest seaports and is a gateway for trade between America and Asia. Currently, the Port handles more than 6.8 million containers and manages 2,000 vessel calls. So, time is money. Due to the ever increasing size of ocean-going container ships, the cranes used to load and unload these ships must also increase in size. Knowing Nordholm’s long experience with raising, moving and modifying container cranes, Lydig Construction, the general contractor chosen by TTI to manage their renovation project, chose Nordholm as their lifting and moving equipment supplier and engineer of record to lift these cranes for the installation of new, longer legs to increase handling ability of their existing ship to shore container cranes. 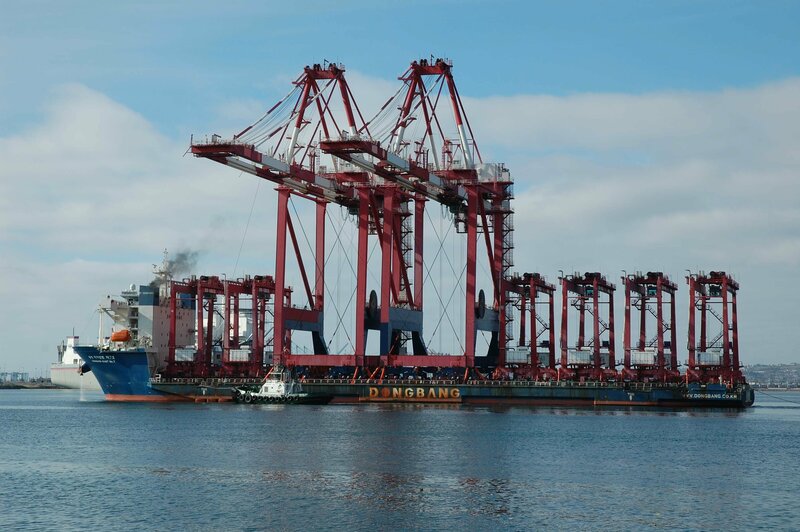 With their increased height, these cranes will be able to load and unload the newest, massive cargo ships. For the project, Nordholm designed and built a completely new semi-automated lifting system. Nordholm also drew up and furnished the conceptual plans for the raise and site moves. His new system has a 2,000-ton load capacity and a moving system capable of moving cranes with a self-weight of up to 1,750 MT, at a lift rate of 8′ an hour. On this job, that meant a raise of 38 feet took about 4-1/2 hours. And yet the Nordholm jacking system weighs in at about half of the standard Push Up system. The lift system sits on the crane’s own sill beams, which results in a substantial savings in time and costs as well, since less load spreading is required, meaning less setup and break down time. All components of the system fit easily in cargo containers for safe storage and transport between jobs. 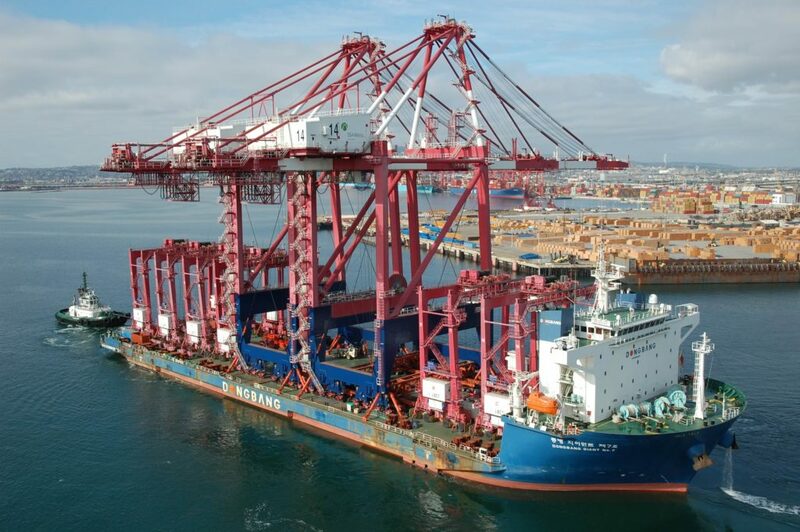 The well known Nordholm container crane moving system will be used to move cranes in and out of the work area, giving additional flexibility to the project as the work area can be located in a remote part of the terminal so as not to obstruct the normal terminal operations. Another job is done well, the Nordholm way! This video shows the critical move sequences for one of the new series of Washington State 144 Car Ferries. Nordholm devised the loading and transferring sequences that enabled the ferries to be built at Nichols Brothers on Whidbey Island and at the Vigor Shipyard in Seattle so that the State DOT could gather the political support through two different major political areas being involved in putting together the financial package to start building the series of ferries. We have been involved in all 4 of the ferries built to date. The superstructure in this video was built on Whidbey Island, skidded aboard a 330 x 86 ft wide barge then transported to Seattle to the Vigor Shipyard. At the shipyard, we moved the hull from its construction spot, out on a finger pier, then when the bow was added, moved the whole lower hull into a drydock. Meanwhile, the barge with superstructure was brought in its own drydock adjacent to the lower hull and skidded across the gap into position to be welded out in its entirety. Superstructure weight in moving condition about 1200 tons. Hull in moving condition about 2,100 tons. The operator in this video is Corey Middaugh, a valued superintendent who recently passed away.